The study tour to Central America will focus on the people, culture and history of Central America including our Central American brothers and sisters in Christ, as well as the incredibly diverse plant and animal populations of the jungles of tropical highlands and beaches. In class, students will give presentations about history, culture, beliefs and other aspects important for our trip. They will also write a short paper, write reactions to some readings and learn or review survival Spanish. A reflection/observation journal will be required on the trip. We begin our study tour by visiting the ancient Maya site of Copan, Honduras where we will learn about the early Maya culture that settled there and observe how that culture and its beliefs have influenced today's society in this region. Our next stop in Central America is Guatemala. While there we will visit a Basilica which houses the famous Black Christ and a colonial town, Antigua,.Arriving in Costa Rica the high adventure portion of our trip kicks into gear. We will visit & hike around volcanoes, waterfalls and other natural wonders. We'll enjoy swim in rivers, hot springs and the Pacific Ocean. We travel to the high mountain cloud cap forests of Monteverde where the adventure continues with a night rainforest hike, zip-lining, bungee-jumping,* canyoning,* and a number of outdoor activities* you can choose. We'll spend time with the Central American people learning about their beliefs and their culture. We'll also learn about coffee production in Honduras & Costa Rica. There will be a lot of outdoor activities on this trip including walking, hiking, a guided night hike through a cloud-cap forest, climbing pyramids & temples, zip-lining, canyoning, * rappelling,* and water sports as weather permits. * Activity costs extra-you must pay for this activity. Day 1 Arrive to Honduras. Private bus to Copan Ruinas, Honduras. Day 3: Visit Mayatan Bilingual School: Tour Macaw Mountain Bird Park, Miramundo coffee roasters After-school activities: soccer, volleyball & basketball with the students at the school. Day 4: San Rafael Coffee Roasters & creamery. Tour & hike to La Pintada Indian village (Chorti Maya village) Los Sapos (ancient maya birthing site) & hike to the top of the mountain to a Maya outpost for a great view of the valley. Day 5: Tortilla making lesson & meal with a local family. Church service at Iglesia Bautista Las Brisas. Day 6: Leave for Guatemala by private bus. Visit Esquipulas Basilica, home of the black Christ. Travel to Antigua. Day 7: B 7:30a. Morning volcano hike. Afternoon cooking lesson at el Museo de Chocolate! Day 9: B 7a. To Guatemala City. City tour. Day 10. Fly to San José, Costa Rica City tour: Palacio de Bellas Artes, Catedral, Jade Museum. 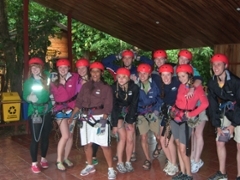 Day 12: La Fortuna waterfall hike & rope swing/diving hole in river: Arenal Volcano. Day 13: 7:00a B. 8:00am to Monteverde. Night rainforest hike. Day 14: B 6:30a. Zipline includes Tarzan swing & rappel. Tour Frog Pond. Day 15: B 6:30-7:30a. Choose your own extreme adventure*: Canyoning (rappelling down waterfalls), horseback riding, bungee or zipline at different place. Day 16: To Nicoya National Park (avg high temp: 92!) via ferry from Punta Arenas. Day 17: Curu Beach, Tortuga Island (snorkeling), Bioluminescent swim. Day 18: Ferry for return to Punta Arenas. Bus to San José via Sarchí wood crafting village. Day 19: Póas volcano, if not erupting. La Paz Waterfall Garden includes hike to several waterfalls. Day 20: Café Britt coffee tour. Farewell dinner at Mi Tierra. Day 21: Leave for PDX. * Activity costs extra - you must pay for this activity.